Early childcare researchers have learned a lot about the ways the brain functions in very young children. Many parents, as a result, want to help their child develop better thinking skills. 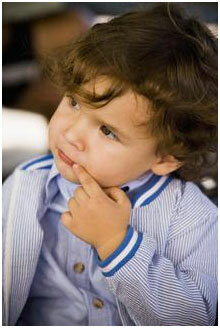 Research has shown that one of the best ways to develop thinking skills is through the art of questioning. There are different levels of questioning from the adult and also various responses from the child. It has been found, quite logically, that lower-level questions elicit lower-level responses. Higher-level questioning, on the other hand, tends to elicit higher-level thinking responses. Let’s discuss some of the differences between lower-level and higher-level questions and responses. Which character in the story did they like best? What are some of the things they like about that character? Does the character remind her of someone they knows? In what ways? Ask the child to tell what happened in the story in their own words. At some point during the story, pause to ask them to predict what they think might happen next. Ask for their reasoning. Actively involving the child in the reading of the story and personalizing the outcomes, will help to make storybook time more enjoyable. Giving her an opportunity to react to the story as an active participant not only will add to her enjoyment but will also help her to develop higher level thinking skills.